Simple ideas can make a home more accessible, especially for people losing their sight. The Royal National Institute of the Blind says it is important to take simple, inexpensive measures like ensuring good colour contrast when choosing paint colours, furniture and flooring. It showcased some of these ideas during the BBC Good Homes Show at the NEC in Birmingham which runs until Sunday. "Contrast is a simple concept but it is also very practical," RNIB's Bill Alker told BBC News Online. "It can actually help a blind or partially sighted person do simple tasks like cooking. Or it can actually reintroduce cooking to someone who's lost their sight." 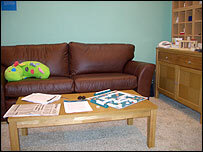 The RNIB's living room display features pale green walls, a dark brown leather sofa and a light beige carpet. The kitchen area has a wooden floor which contrasts with pale kitchen units and dark work surfaces with an inset white sink. The kitchen cupboards have dark coloured handles so that they can be more easily located. The organisation is also promoting a range of kitchen equipment for visually impaired people. The wall clock has extra large numbers, the scales speak as well as giving a visual readout, and there are liquid-level indicators to avoid over-filling a cup as well as a talking kettle. On the home entertainment front, RNIB is promoting a new Freeview digital TV decoder - the Netgem - which includes 'audio-description' - a separate narrative track which describes what is happening on screen. 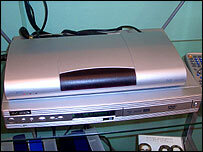 There is also a growing number of audio-described films on video and DVD. Broadcasters are now working towards a target of having 6% of their programmes audio-described. "On Freeview 13 channels are taking part," said RNIB's Clive Miller. "Once Ofcom gets its code of practice together and gets itself organised, all non-exempt channels will have to describe 10% of their output within 10 years." The BBC is already audio-describing soaps like Neighbours and EastEnders, and ITV and Channel 4 are doing the same for programmes like The Bill and Friends. Some audio-description is available to Sky subscribers - on Sky One, Sky Sports and Sky Movies as well as Five when viewed on the Sky platform. The difference with the Freeview technology is that it allows the viewer to adjust the sound level of the narrative track independently. "They're now working on an adapter which will give you a separate feed on headphones," said Mr Miller. "So you could be sitting in a mixed environment where some people don't want the audio-description but those that do can have it on headphones." Although live broadcasts are not currently audio-described, Clive Miller thinks it might make sense to have two separate commentators for big sports events. And he says RNIB is trying to encourage better practice among presenters. "There are some techniques that commentators can use that make such a big difference - they just need to describe a little more rather than saying things like 'Oh look at that', which isn't much help." Mr Miller says the RNIB is currently working with cable and satellite companies to try to make the audio-described programmes already available on Freeview accessible on these platforms as well.